“Amma, you missed a fort!” cried Samhith. We were on our way from Pathankot to Dharamsala, and I had somehow fallen into a deep sleep. I was still groggy, but the word ‘fort’ was enough to wake me up. Or maybe it was the enthusiasm in his voice. He went on, describing how big it looked, and how it stood atop a hill, and all I thought was – I didn’t know there was a fort here! “Had you heard of the Nurpur Fort?” added Shankar, intruding into my thoughts, and I shook my head. For the first time, I kicked myself mentally for not being prepared enough, and decided we would stop on our way back. 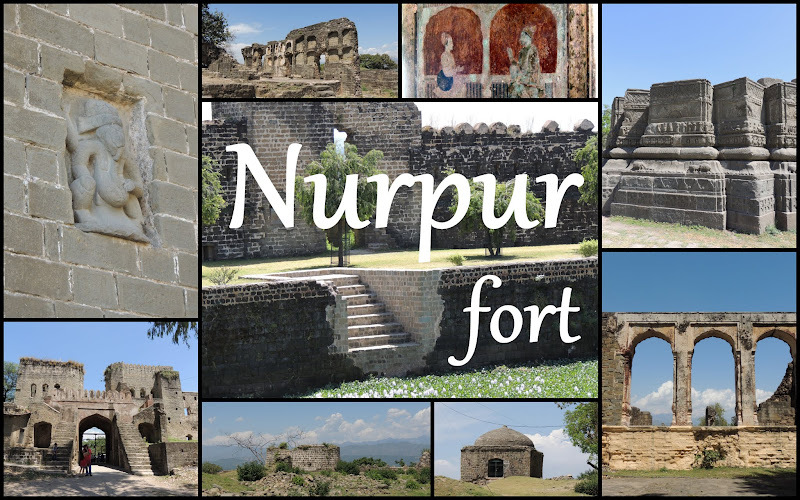 4 days later, as we headed back to Pathankot, we informed our driver that we wanted to visit the Nurpur Fort. “There is nothing to see there, Madam” he replied, but we stuck to our guns. Turning off from the main road, it was evident that this must have been quite a fort at one time. The rise was steep and the winding path perfect to ambush unwanted visitors. At the top, was a surprisingly big complex housed in ancient, crumbling buildings. There was a court, some kind of government offices, and also the local jail! A sharp curve brought us to a massive gate, which seemed surprisingly intact. A pair of Ganeshas looked down at us from their niches on either side. A number of vehicles were parked outside – cars, autos, and motorcycles. I wondered what all these people were doing here. Were they tourists like us? Our driver had told us that hardly anyone came up here to see the fort! Ganesha looks down on us, from the ramparts at the entrance. The gates opened into a huge open space, surrounded by ruins. On one side, was a relatively new structure, housing the local school. A board for the NSS stood in front of one of the remaining turrets. It was evident that the fort was still used, albeit for purposes other than originally intended. The local high school, established in 1928, according to the plaque. The bright NSS board stands in front of one of what must once have been a watch tower. There was no sign of the people who had parked their vehicles outside, and neither was there any sign of the ASI, which was supposed to be maintaining this heritage structure. The only mention of ASI was this scrawl on a rotting door. this is the only presence of the ASI we could see in this fort. We walked further inside, looking around, clueless of its history, amazed by its size, and curious about the stories that lay hidden from our eyes. A huge peepul tree stands in the centre of the huge clearing. Its size indicates that it must be quite an ancient tree, and it reminded me of the similar tree we saw at Kangra Fort. To get an idea of the size of the tree, and the fort, look closer and notice the two men walking on the path by the side of the tree! On our left was a lake, cordoned off with barbed wire. Beyond it were the fortifications, which had been visible from the road. A newly painted arch beckoned, and we headed there, hoping to find someone to tell us about this place. What we found instead, was a wedding crowd, all squeezed inside a mandap just outside a temple. Walking in, we felt numerous pairs of eyes, all focused on us. It was so unnerving, that I didn’t click a single photo, and instead turned to the board telling us that this was the Brij Raj Swami Mandir. Here at last, was some information about the temple, as well as the fort. This town was originally called ‘Dhameri’, till the Empress Nur Jahan visited. She loved the place, and in memory of her visit, the town was renamed ‘Nurpur’. The temple here was originally the Diwan-e-khaas, the court where the king received his most important visitors. Then, sometime in the 1620s, the king, Raja Jagat Singh, visited Chittorgarh. He was given a room near the Krishna Temple there, along with his priest, who had accompanied him. That night, they heard the sound of anklets, and then, the melodious tunes of bhajans being sung, not just perfectly, but with absolute devotion. They were convinced that it was Meera herself singing to her beloved Krishna, and, the next day, when they took their leave, asked for the idol of Krishna as a parting gift. The king obliged, and when they returned, Raja Jagat Singh converted his audience hall into a temple for the Lord. Krishna stands on a pedestal on the first floor, where the royal throne once stood, and below him, the walls of the audience hall are covered with paintings. They are now faded, but you can still make out the stories they portray. Most depict incidents from Krishna’s life, such as his encounters with demons, while others depict the king, and scenes from royal life. One of the paintings on the wall. Note the floral decoration which divides two paintings, and the series of events shown on the panel below it. The main painting, against a red background, depicts the events at Mathura, when Krishna arrives in the city. On the right is the royal elephant, Kuvalaypeetham, which was sent to kill Krishna, but Krishna instead kills it. Then, Krishna and Balarama wrench out its tusks and carry them to the arena,where the wrestlers Chanura and Mushtika are waiting. (on the left). Living in the midst of heritage. People peacefully living in the temple, surrounded by these beautiful paintings, but unaware and indifferent to their importance. One section of the wall has been whitewashed, as you can see. I hope the remaining paintings survive. As I walked around, photographing the paintings, a bunch of kids followed me. The smallest one piped up “Aap in puraane chitron ka photo kyun le rahein hain?” (Why are you clicking photos of these old paintings?) I smiled, and replied, “kyunki yeh bahut acche hain, aur mujhe pasand hain (Cause they are beautiful and I like them). That seemed to break the ice, and the whole bunch joined in the conversation, which ranged from the paintings, to where I was from, to their school, and the wedding they were here to attend. A parent arrived to see who they were chatting with, and tried to shoo them away, but they continued to chatter till I clicked one last photo of them, and hurried back to Samhith and Shankar waiting patiently outside. Arches on the other side of the temple. See the photo of the temple, and notice the similarity to the arches at the entrance. Imagine what a beautiful structure this must have once been!! Wandering into another section of the fort, we found ourselves in what must have once been the queen’s quarters or the royal residence. There were decorative niches all over the walls, much of which were intact. The roof had caved in, as had part of the walls, but enough remained to give us a glimpse of how beautiful it must have been. A curved staircase was the only suggestion that originally, there must have been a level above, or at least a terrace. This portion looked over the valley, with a superb view of the mountains beyond. This appears like the queen's quarters to me, going by these niches which may once have held mirrors and other items. but there was no on to confirm or correct me. What do you think? The view from the fort. The snow capped peaks in the distance are the Dhauladhars. Further on, there were remnants of what might have been the kitchens, and then a platform atop which stood the remains of a temple. The base is all that is left now, but it must have once been a grand structure. Every inch of the base is covered with carvings, intricate and detailed. There are cows and camels, flowers and birds, and of course, deities. The remains of the ancient temple... this might have been just the platform or base! Details on just one side of the platform! notice the different levels and the different works on each level? Each intricate in its own way! We walked around, trying to identify the stories depicted, exclaiming over every new detail we noticed. I was fascinated by the depiction of the Dashavatar – the ten incarnations of Lord Vishnu. Never before have I seen the first two avatars – Matsya (fish) and Kurma (tortoise) depicted in their animal forms, without a human face. Matsya (fish) on the right and Kurma (tortoise) on the left. Have you ever seen a similar depiction? Most of the figures had their faces destroyed, whether by intention or due to nature, we had no idea. It was difficult to identify the other figures, and it was frustrating that there was no one around to enlighten us. Our driver beckoned to us from the entrance, and we realized that we had lost track of time. We had a train to board, and it was time we left. A few people were standing around, and they turned as we approached, obviously curious. “Where are you from?” someone asked, and when we replied “Mumbai”, the curiosity increased. “You came all the way from Mumbai for this fort? There is nothing to see! !” an old woman exclaimed. The entrance of the fort, and a bunch of women chatting. “Oh, there is so much to see here.” I replied. “You have such a grand fort here, with such beautiful carvings in that ruined temple. Besides, the ancient paintings in the Krishna temple are amazing. You should be proud of them.” They looked stunned, hearing these words from a complete stranger, from a faraway place. For them, it was the deity who was important, the one to whose shrine they came for weddings and celebrations, or to pray for good fortune. That there was more to it was something they had probably never even thought about. But then, it isn’t their job to, is it? It should have been the ASI here, restoring this grand structure, preserving what remains of it, ensuring that the paintings remain as they are, for generations more. However, the fort lies forgotten, the haunt of students bunking class, or lovers looking for seclusion. The Krishna temple is the only structure still in use, but even there, the paintings are fading, and in dire need of restoration. A section of the fort off limits to visitors. We were all quiet as we drove away, each of us filled with our own thoughts. There was an overwhelming sense of sadness, at the state of the fort. However, there was also a deep pleasure, that we had found such an unexpected gem on our trip. Samhith turned to me as we sped along the highway. “It was a nice fort, na, amma? And you only saw it because of me!” he preened. For once, I had to agree. Location: Nurpur is 28 Km from Pathankot and 60 Km from Dharamsala. Pathankot is the nearest city, and is well connected to the rest of the country by the railways. Nurpur Road is a small railway station on the Kangra valley railway, between Pathankot and Dharamsala. The nearest airport is at Gaggal (Kangra / Dharamsala) 45 Km away. Where to Stay: The best options for accommodation would be at Pathankot and Dharamsala, both of which cater to all budgets. Those carvings and paintings are impressive, even in the state they are currently in! Like you, I bet the fort and temple were amazing in their heyday. Thank you for the tour! Glad you liked it, Natalie! There are so many such structures lying around, in a sad state of neglect. We were lucky to have stumbled on to this one. Hope I can find many more and share info about them too. Great post and awesome pictures ..!